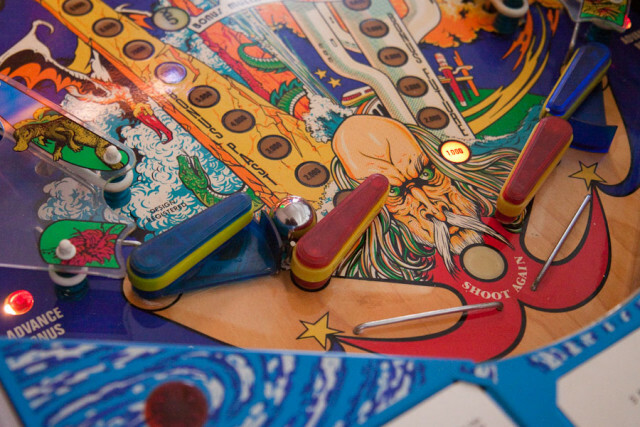 I’m currently doing some repair work on a couple of Zaccaria pinball machines for Lyons Classic Pinball. Zaccaria was an Italian pinball manufacturer and it’s interesting to see a few features that you don’t usually see on U.S. made pinball machines. 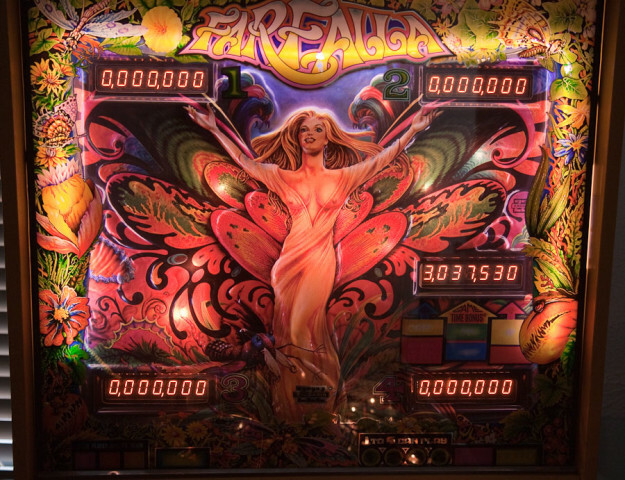 The pinball machines are Time Machine and Farfalla (which translates to Butterfly in English), both of which were manufactured in 1983. Both machines use a neon tube for a light source around the perimeter behind the backglass. The backboards are made from a vacuum formed plastic which makes them three-dimensional. Both machines have an elevated shooter lane that allows for a wider playing field that takes up the full width of the cabinet. Where ever there is a location where the ball needs to come down to the main playfield, a wire ramp lowers by the weight of the ball, allowing the ball to roll down rather than being dropped. This saves wear and tear on the playfield. 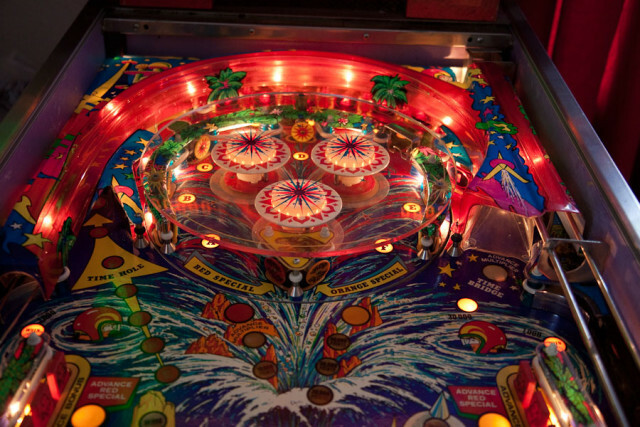 At top of photo, a wire ramp that lowers the ball to the playfield without dropping it. 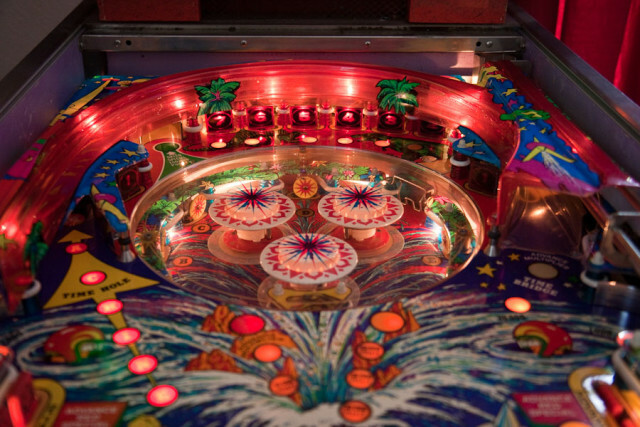 On some dual flipper games like Captain Fantastic, the ball can be lost between the flippers. On Time Machine the outer flippers have some extra plastic on them allowing the player to trap the ball on the inner flipper without it draining. The dual flippers on Time Machine are designed to not let the ball drain between them. On the far right is the flipper at rest. 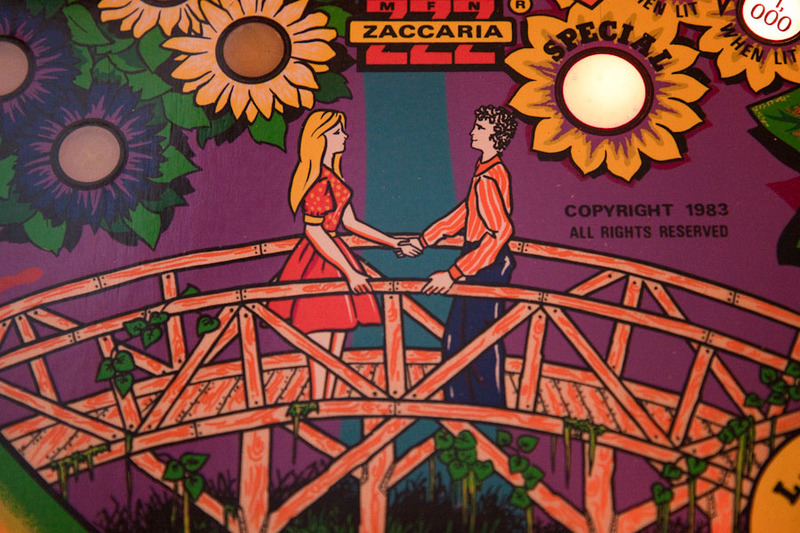 At the time, Zaccaria was into making pinball machines with transparent upper playfields. Upper playfield of Farfalla. 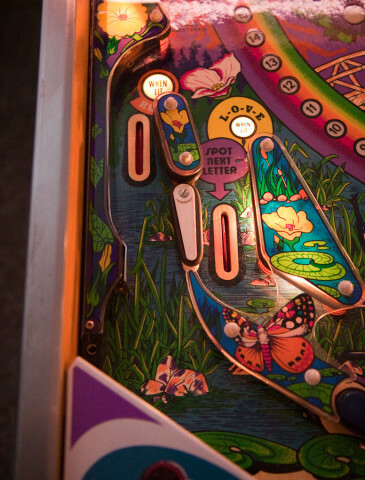 Note again the wire ramp between the flippers that lowers the ball to the main playfield without dropping it. Time machine has a transparent playfield that raises and lowers. Center playfield on Time Machine in the raised (“Future”) position. 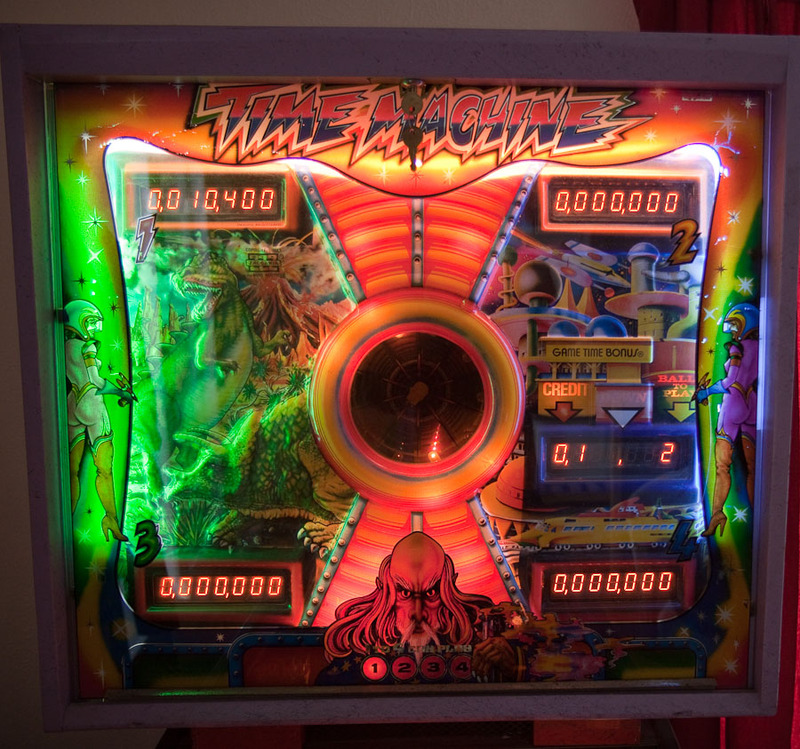 Center playfield on Time Machine in the lowered (“Past”) position, allowing access to the targets at the top. 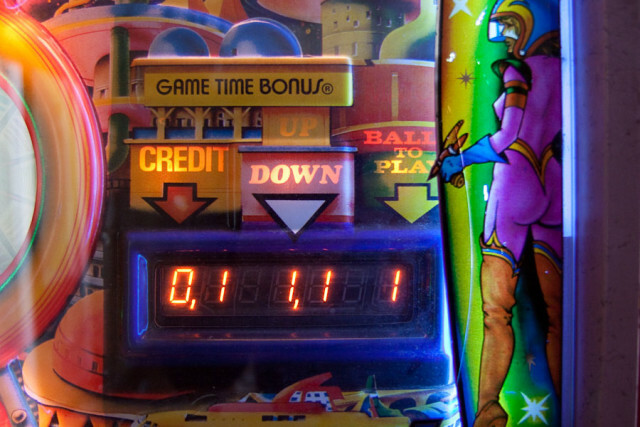 On most U.S. pinball machines, the ball count starts at 1 and goes up from there. On these Zaccaria pinball machines, the ball count display starts at 3 and counts down, giving you the number of balls remaining. Many Zaccaria pinball machines have a feature called “Game Time Bonus”. On the final (3rd) ball, the game time bonus counts up. It increments every time a target is it. The better the player plays the final ball, the longer time they have for the bonus ball. Game Time Bonus in bonus ball count down mode. The bonus ball is the 4th ball played (assuming you weren’t awarded any extra balls). As soon as the ball is shot, the counter starts counting down. The idea is to better your score with time remaining. When the time runs out, the flippers go dead and no more scoring occurs. One cool thing with Time Machine is that if you get the game to go “into the past”, the countdown stops and you can play the bonus ball as long as you stay in the past. As soon as you return to the future, the countdown continues. If the ball drains before time has run out, you get another ball. So in effect you have unlimited balls as long as time remains. Farfalla has flippers beside the outlanes which under certain circumstances allows the player to save the ball. Farfalla has outlane flippers allowing the ball to be saved. The flipper ‘flips’ up to the left. The outlane flipper is armed by a playfield switch located directly above the flipper in the outlane. Once armed, the flipper can only be used once. 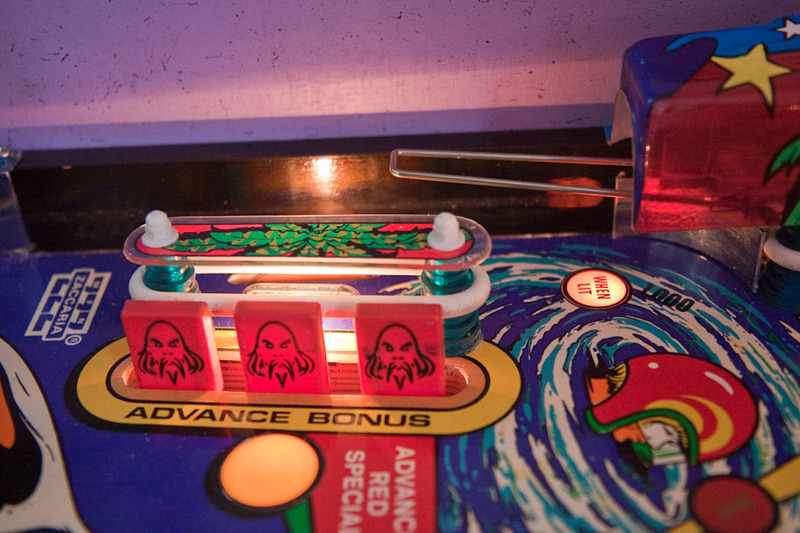 You have only a fraction of a second between the time the flipper is armed and pressing the flipper button. The odds are against you, but the ball can be saved. 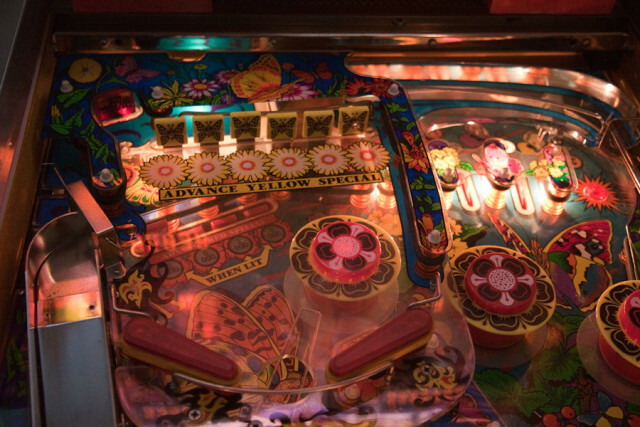 How many pinball machines have a Love theme? (From Farfalla). In spite of the theme, the game is fun to play. Another interesting thing, these machines have a headphone jack mounted next to the coin door. I know of several tech companies which have pinballs for their employees to use when taking a break. A headphone jack would be handy. Instead they turn the volume down to where you can barely hear it. Both machines have very colorful artwork and we might convert them over to LED lighting. At present, LCP hopes to bring both of these machines to the Rocky Mountain Pinball Showdown in June.